The Pooldeck LC ladder is a popular commercial ladder which fits most applications. It features a horizontal bar bracing the frame giving it extra strength. The Pooldeck LW ladder is designed for pools that have a wet deck. It features a horizontal bar bracing the frame giving it extra strength. The Pooldeck G6 Grab Rail has been designed for the swimming pool that has vertical steps in the wall. Tear drop shape. 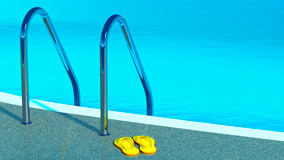 The Pooldeck HG Hand/Grab Rail has been designed for the swimming pool that has steps leading into it.